Retiring CEO Charlie Hall brokered AM General's contract to manufacture the large Mercedes-Benz R-class crossover. AM General, manufacturer of specialty military and civilian vehicles, has named Andy Hove CEO, replacing Charlie Hall, who is retiring. The transition will take effect in early 2016. The announcement was made jointly today by South Bend, Ind.-based AM General and Solon, Ohio-based HDT Global, where Hove has been CEO since 2014. HDT Global makes military vehicles, mobile generator systems, shelters, filtration systems and other specialized equipment. Hove, a manufacturing expert with experience working for a number of defense contractors, takes over AM General as the company seeks to reinvent itself as a versatile contract manufacturer of military and civilian vehicles. AM General is best known as the manufacturer of the Humvee military vehicle. It also built the Hummer H2 SUV for General Motors until GM shut down the Hummer brand in 2010 after the proposed sale to a Chinese company fell through. Hall, an executive with a laconic, no-nonsense manner, led AM General on its drive to redefine itself as a versatile contract manufacturer. 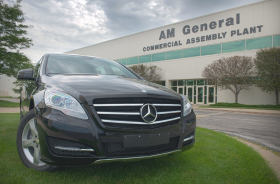 He brokered AM General’s contract to manufacture the large Mercedes-Benz R-class crossover for the Chinese market. Production began this year at AM General’s Mishawaka, Ind., plant. AM General also builds the MV-1, a van built from the ground up for wheelchair users. Hove, an Army officer for 11 years, has worked for a number of military contractors including United Defense, FNSS Defense Systems and Oshkosh Defense, where he led 3,000 employees and was instrumental in securing several military vehicle contracts including the FMTV and M-ATV. AM General employs 1,500 people.